...but which would you pay more attention to--a digestive problem or joint pain? Just last weekend, a young teenage friend asked me how to decide where to focus your healing efforts when applying this alternative health remedy. (She knows I practice homeopathic medicine on myself and all of our children.) I found myself giving her a skeleton review of the "Laws" or ranking systems used in homeopathy. So, here they are for you, too! Sure, that's almost a silly title, but couldn't think of anything better. Homeopaths consider the physical, emotional and mental health of their clients. Here they are in order of most important descending to least important. So, if your digestive problem resolves, and you're left with a skin irritation, that's progress. It means your body is, well, pushing out the infection to a less crucial zone of the body. Makes sense, since this is a holistic treatment, eh? The healing would come from deep within, and affect your entire system. Another principle in this alternative medicine considers the following symptoms, giving them different weight. specific physical symptoms -- such as a localized pain: these are often the most obvious, but carry the least weight, according to homeopathic science! general physical symptoms -- such as lethargy or sleeplessness: these are weighted second most important, since they are system-wide (body-wide). mental or emotional symptoms -- (This surprised me.) such as confusion or a sudden desire to clean one's room: these are weighted most heavily to a homeopath because of what they indicate. ...I find this this holistic science fascinating! Hope you've learned something of value, and have enjoyed your time spent reading this. My thanks to Dr. Stephen Cummings and Dana Ullman, M.P.H., for their clear lists and guidelines. Mr. Ullman has a Masters in Public Health from U.C. Berkeley; Dr. Cummings is both a doctor and Professor of Medicine and of Epidemiology at U.C. San Francisco. 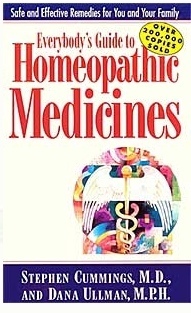 A copy of their book (pictured above) Everybody's Guide to Homeopathic Medicines sees much use at my house. To read more of my own experiences with Homeopathy and casetaking. To the introduction page on Homeopathic Medicine. Or, head on over to Healthy Alternative Solutions home page.